The Pico Projectors Have Arrived! are of theater quality, rich with features, very affordable, and designed to serve a wide range of applications. With over a 1,000 different projector models to choose from, it helps to know what you want. This article focuses on a new generation of personal projectors that, for better or worse, have been called pico projectors by the industry. The pictures you see in this article are some of the early contenders. The name, pico, was intended to imply a very small projector, but pico was pushing it. Technically speaking, pico implies a trillionth (10-¹²) of something and while these puppies are tiny compared to the traditional light canon, they're a far cry from a trillionth. Ah, the power of marketing! bestowed that name on another small projector - the pocket projector. But I digress. Pico . . . Pocket, no matter. You'll recognize it when you see it. So before we begin, let it be known that projectors are packaged to serve specific needs. If you need something to light up a theater, or to take on a sales call, or connect with a classroom full of kids, there are plenty of projectors to choose from. However, if you're looking for a personal projector that fits comfortably in your pocket and is suitable for video or data viewing by yourself or with a few friends or associates, the pico projector may be what you need. The pico projector is a handheld projector designed to project your photos, video, presentations, or electronic documents onto almost any surface, anywhere, and anytime for personal viewing or viewing by a small group. Audio can be supported by plugging in a headset and a few pico projectors have also integrated a small speaker. You will likely find the performance of these speakers wanting due to the lack of size and power. 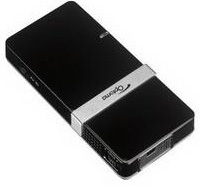 Today the pico projector may be purchased as a stand-alone unit, such as the 3M MPro 110 and the Atlantis APSE-10A. 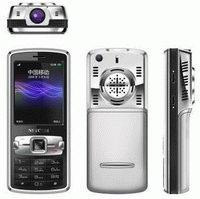 It is also being integrated into other handheld devices, such as the Logic Wireless Bolt cell phone and the Butterfly Micro-projector MP3 player (also sold under the name Focupix). The pico projector will continue to be integrated into other mobile technologies such as cameras, computers, cell phones, media players, PDAs and gaming devices provided that the power management and cost can be effectively managed. As a stand-alone device, the pico projector is about the size of a cell phone and fits easily in your pocket. On average a pico projector is about an 8th the size, a 4th the weight, a 10th the brightness , and a 3rd the cost of a pocket projector, but with slightly less resolution (640 x 480) than a pocket projector (800 x 600). 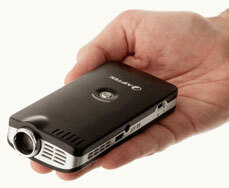 A few pico projectors are even lower resolution (480 x 320). All of the stand-alone models we have seen will accept a higher resolution, in some cases as high as WXGA. The higher resolutions will be scaled down to fit the resolution of the pico projector. But for best results, try and set your input source to match the resolution of the pico projector. About a dozen manufacturers have announced or are shipping their first pico projectors either as stand-alone units or integrated into other handheld devices. You can expect to find some of these models under other names as private labeling is a common practice. Picos use LEDs as their light source, which means the light source will outlive the projector's useful life and provide efficient use of your battery power. The display technology will either be DLP™ or LCoS and you might consider looking at both technologies to see if you have a preference. Laser technology is also in development, but to our knowledge no laser units are shipping. bigger cousins. Case in point, the 3M MPRO 110 pico projector is rated at 6 ANSI lumens. For you gear heads that know all about ANSI lumens, stop rolling your eyes. You're not going to use this on a 100" screen. This is definitely intended for smaller viewing. ANSI lumens are the basic metric for defining how bright an image you can expect. ANSI lumens are measured by averaging the lumen reading on 9 separate points on a 1 square meter image. The higher the ANSI lumen rating the brighter the image will be for a given image size. Or conversely, the smaller the image the brighter it will be for a given ANSI lumen rating. In the case of the 3M MPRO 110, what happens to the 6 ANSI lumens when you reduce a square meter image to a 4 inch image? I'll spare you the math. It makes the 4 inch image 200 times brighter than the square meter image, or roughly 1200 lumens. Conversely, if you expand the image to a 40 inch diagonal, you essentially increase the size of the image by a factor of 100 and correspondingly reduce the brightness by a factor of 100 because we're spreading the same amount of light over a larger area giving us roughly 12 lumens. while adjusting your distance to the screen. A laser pico projector does not require a focus wheel. Image size is adjusted simply by moving the pico projector. Since pico projectors lend themselves to shining an image on walls, ceilings, shirts, a sheet of paper, a menu, the back of an airplane seat, and anything and everything else within reach, they give you great flexibility; however, keep in mind that the quality of the image will depend greatly on the quality of the surface you use. The more reflective the surface and the more neutral the surface color, the better your image quality will be. What are the limitations of pico projectors? composite video and RGB. Most cable offerings are relatively short on the assumption that the device you intend to connect will be close at hand. If you own a longer cable, you can always use it as an extension. Some of these units also come with a miniature tripod, which is a very nice accessory to have to adjust your image height and stabilize the device in a hands free environment. If you have a thick cable, such as a standard RGB cable, you'll find that the cable will control where the pico projector points. It's like trying to control a small sprinkler on the end of garden hose. The hose always wins. Where are pico projectors headed? Pico projectors will migrate into the devices they attach to. This should happen quickly as it is a natural evolution that eliminates cables, reduces cost and greatly enhances usefulness. The driving factor will be cost, power management, space considerations and market appeal. In other words, for your iPod to become an iProjector, it will need to maintain its look, feel and usefulness and offer a benefit that justifies the cost increment. When you order up your next camera, computer, cell phone, media player or gaming device, you may well be asked "Would you like a pico with that?". I like the cell phone PICO. I just want to know where I can buy one right now. These will be fabulous... in 5-10 years. LED technology (which may eventually even replace headlights on cars?) and solid state (to use the obsolete term) circuitry will eventually make pocket projectors work as well as at least the lower end home theatre projectors do today, and hopefully prices will drop too. I can't wait for the day when you buy a DVD (or Blu-Ray... or whatever the fomat is at the time) player that has a projector built in that allows you to shoot a 60" image onto a wall and do it for about $200 or so. Oh, and have a "lamp life" of 100,000 hours or more. Better than paying $400 for a lamp now that lasts a mere 3,000 hrs, hunh? Just for fun, Ejimbo is a bit behind on the LED Headlights. A couple of Very High end cars are already offering this option. I understand the bulbs are still over $100. each which is why they aren't in anything affordable yet. Besides, the auto companies have warehouses full of the older bulbs, not to mention Contracts with suppliers to purchase more. I find it odd that these projectors are so limited in their brightness, considering that LEDs that put out well in excess of 200 lumens at voltages as low as 3.7V are extremely common. And this is with a small emitter (LEDs with large emitters can put out well over 2000 lumens). can it be used with pen drive for giving trainings for 30 to 35 persons without laptops? if not which pkt projctr i shd buy?